Cheddar is a medium sized cauliflower variety that stands out with its bright yellow-orange heads. The 2 lb, uniform heads will produce the best colour with more sun exposure and therefore require less wrapper protection than other varieties. 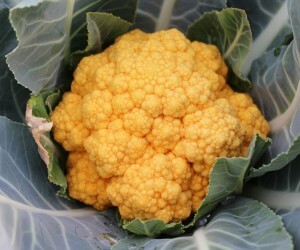 Cheddar has up to 25% more beta-carotene than standard white cauliflower varieties. Mild and sweet in flavour. It maintains its brilliant orange hue even after cooking. Easy to grow.